Manchester United’s win over Tottenham was a game that had everything – lots of attacking football, two excellent teams, some outstanding individuals, and a fascinating tactical battle between the managers. United’s interim boss Ole Gunnar Solskjaer won that particular contest in the first half and I could tell by the way that he and the rest of his bench celebrated Marcus Rashford’s goal together that it was down to the work they had done before the match. The second half was very different – Spurs created a lot of chances and if it wasn’t for United keeper David de Gea then they would probably have equalised, if not taken all three points. I’ve heard all about how he has lifted morale since taking charge, which is great, but seeing his tactics come to fruition will make his relationship with his players even stronger. United’s shape was the key to them controlling the game before half-time, because the way Tottenham tried to play suited how Solskjaer had set his side up. But Solskjaer did not let them do that on Sunday. Instead, he allowed Ben Davies and Kieran Trippier to come on to United’s full-backs and told his forwards to stay high and wide. That gave Tottenham’s centre-halves massive problems because it left huge spaces either side of them for the pace of Rashford and Anthony Martial to exploit. In midfield, United had Jesse Lingard at the top of a diamond to put pressure on Spurs’ holding midfielder Harry Winks and stop balls into him or Christian Eriksen. That is exactly how United’s goal came about. They needed a player with the technical ability of Paul Pogba to make the unbelievable pass that set Rashford up, but the move was made on the training ground and through the work they did last week. Lingard blocked Trippier’s pass inside and gave it to Pogba, who knew Rashford would be making that run. Equally, Rashford knew the pass was coming. He took a fantastic first touch – and found the bottom corner. Both teams changed to a 4-2-3-1 formation in the second half, which was a far tougher period from United’s point of view – they were hanging on at times. I think Spurs were expecting United to stick with their diamond after the break, so they put players out wide to go two on one against United’s full-backs to try and overload them. I am not sure whether United recognised it straight away or if they had planned to change anyhow, but they attempted to combat that by matching Spurs’ shape. It would not have worked if United had stayed with their diamond because the spaces that Rashford and Martial were enjoying before half-time were no longer there – the Tottenham full-backs were not bombing on any more because they had wingers outside them. It was the first time I have seen him act like a real leader, and he looks like a player who has been given the confidence by his manager to be the team’s voice at the back, which is going to be massive for United going forward. As well as the outfield players performed, they would not have won the game if not for De Gea’s brilliance behind them. His composure is amazing and he always remains cool and calm – he does not get too excited when he makes a fantastic save, and he does not let it affect him when he makes the odd mistake. 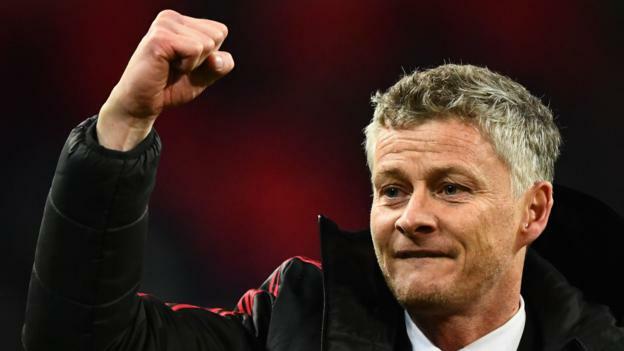 People might look at Solskjaer’s tactical input against Spurs more than they did against, say Huddersfield, but he had to have a plan in that game too. He will also be thinking they can win the FA Cup, and that anything is possible in Europe. That is the mindset he will be putting into his players – and confidence will definitely not be an issue for them.